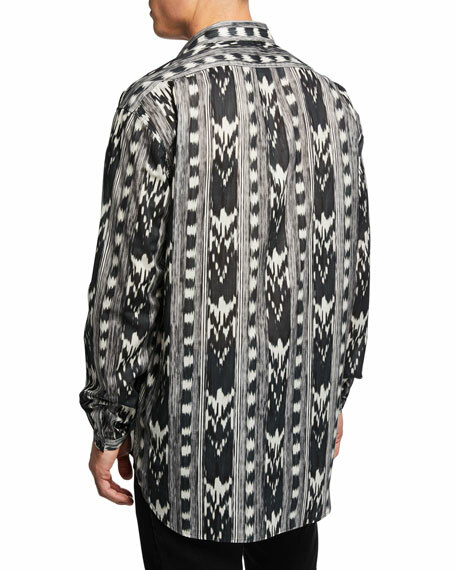 Saint Laurent dress shirt in ikat print. BOSS dress shirt in dotted print. Spread collar; button front. Double barrel cuffs. Slim fit. Shirttail hem. Cotton. Made in Italy. BOSS Hugo Boss dress shirt with tonal flower pattern. Spread collar; button front. Double barrel cuffs. Cotton/nylon. Imported. EXCLUSIVELY AT NEIMAN MARCUS Ermenegildo Zegna dress shirt in solid Vaiella design. Spread collar; button front. Barrel cuffs. Long sleeves. 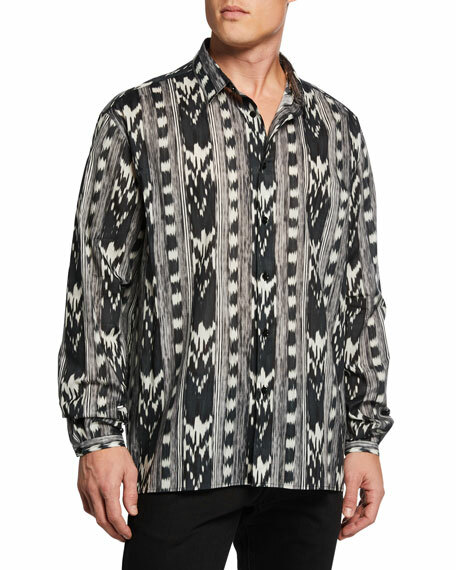 EXCLUSIVELY AT NEIMAN MARCUS Ermenegildo Zegna dress shirt in solid Vaiella design. Spread collar; button front. Barrel cuffs. Long sleeves. Shirttail hem. Cotton. Imported.